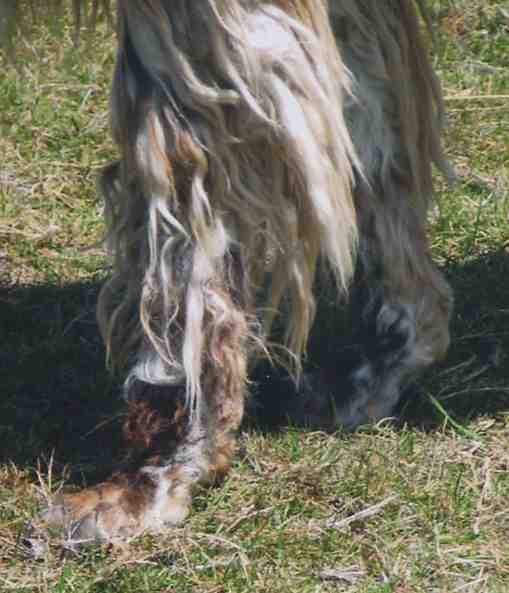 Many people want to understand llama conformation and it can be hard to know what a WELL conformed llama looks like. This page is only a small part of what you should know, but hopefully it can help you to look at some basic things before you buy or breed anything. Remember that a llama can look good standing and totally fall apart when it moves. If you would like to learn more about conformation, you might attend/audit an ALSA (Alpaca Llama Show Association) or ILR (International Lama Registry) judges training clinic near you. The shape of the head is a preference. The eyes should be clear, bright and free from regular discharge. The eye should not be droopy (showing the red area of the lower lid) or hanging down. 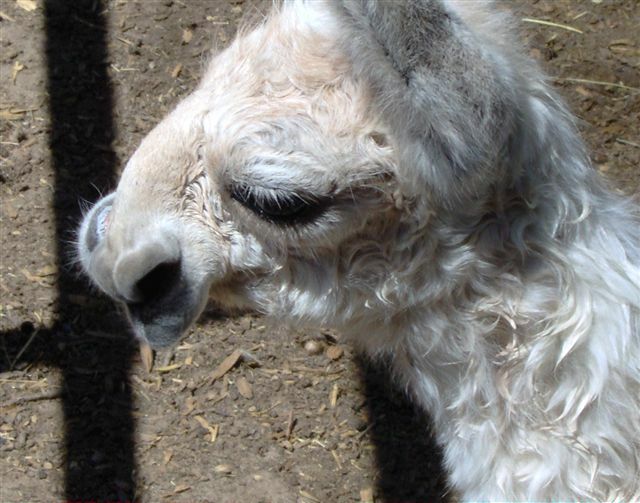 Some llamas will drop their eyelids when stressed so pay close attention to if the llama only does this when they appear to be scared or put into a stressful situation. If they do not do it when just lounging in the pasture, it is most likely just a stress issue. The eyes should NOT be light blue and used in a breeding program. Llama people will say that a light blue eyed llama CANNOT be deaf, this is not true. I know people with blue eyed and deaf llamas. 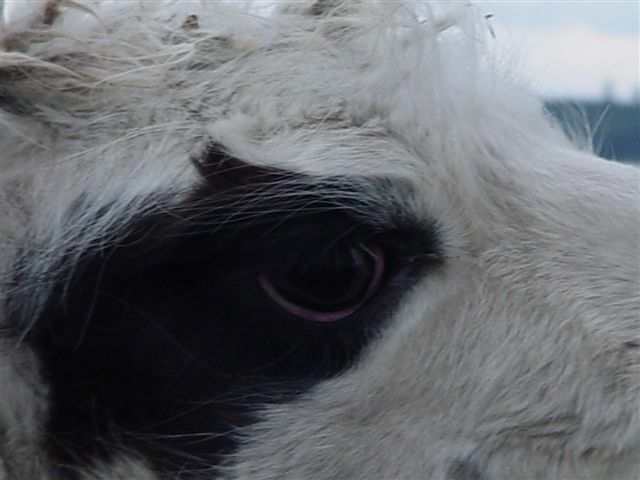 A dark blue eye (they appear dark grey sometimes) is okay to breed from what I have been told by llama vets. 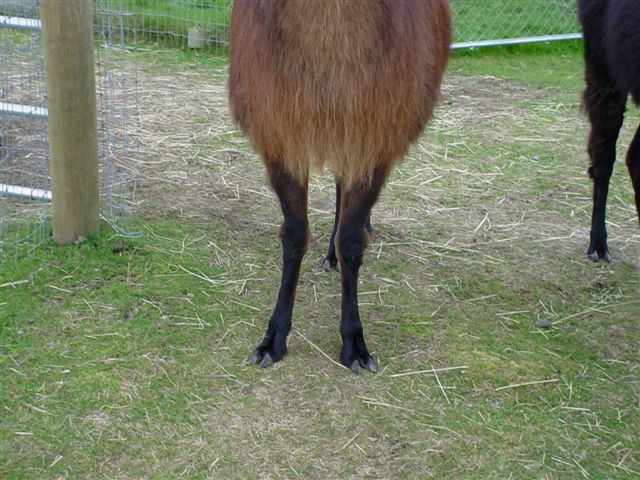 Genetic Cataracts can happen in llamas and in this case these animals should NOT be used for breeding either! Ears are a controversial issue. They do not affect function of the llama. 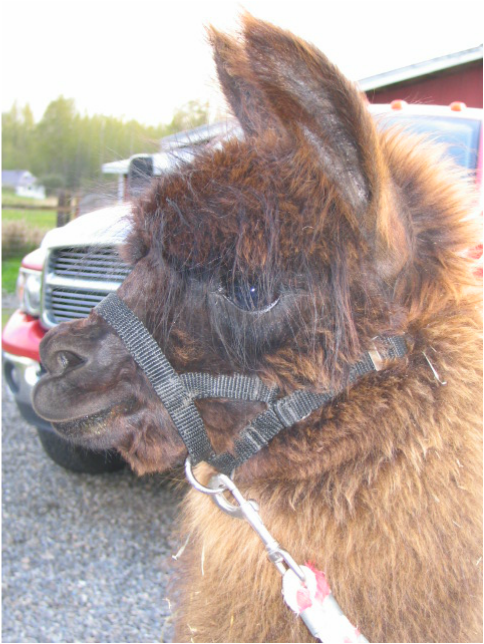 A llama with bad ears can still pack, pull a cart or participate in other activities. BUT in a breeding program it is frowned upon to breed a llama with ears that are short, gopher like (roundish and shapped like a spoon) or otherwise not geared toward the bannana shaped ears most breeders want. 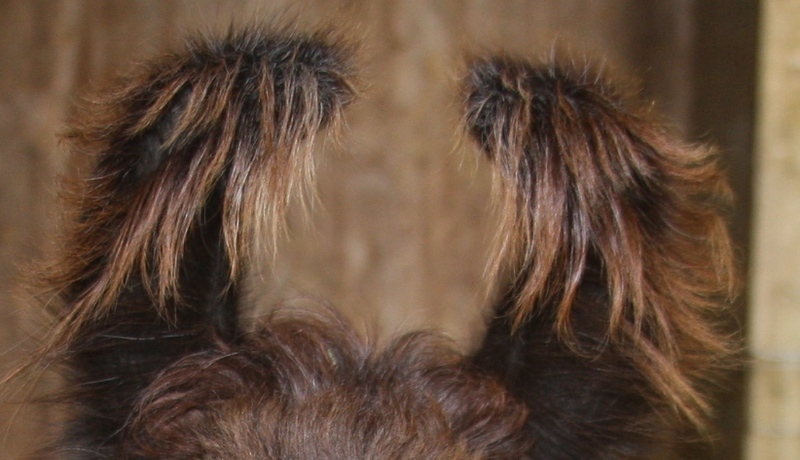 Llama ears should be long, shapely and resemble a bannana. True "Gopher Ears" are very hard to breed out and you can follow them down generations and through various bloodlines. Most breeders do not like ears that sit too far forward on the head (appear to be at a funny angle off the forehead like a visor) either. Bite is an important thing. 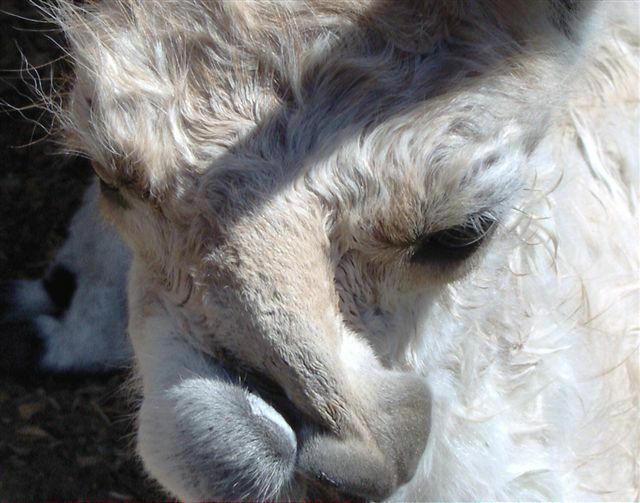 You should always check to see that the llamas palate lines up to the lower teeth. You should also make sure that the teeth are even and there. 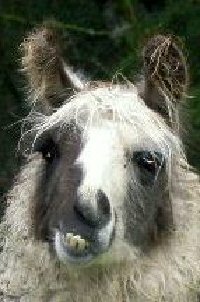 If the llama has worn down their teeth it can be a sign of age or that they may have trouble keeping weight on. 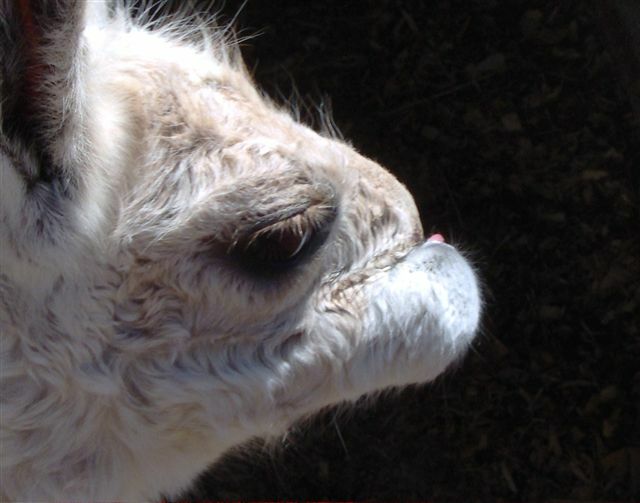 A llama with an underbite or overbite has a parrot appearance usually around their lip area. 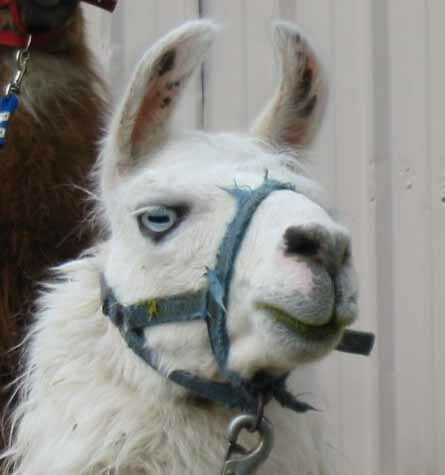 A bite can easily be checked by sticking your fingers in the llamas mouth and running your finger over the teeth and palate. 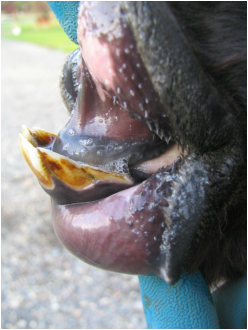 "Parrot Mouth" Upper palate does not line up with bottom teeth. Side shot and then mouth open on same animal. Serious under bite. Mom has the same bite too! Notice the shape of the face on the animal. There is another condition of the face called "Wry Face". It is a twisting of the upper jaw or face to one side. It is not good and is a form of "Choanal Atresia" It can happen at birth or develop over time. The top right and middle two pictures were all taken of a cria shortly after birth that was a CA and Wry Face. The bottom picture is an adult with Wry Face. The body from the side should appear in balance. The back should not be too long and out of balance from the neck and legs. The legs should appear to be straight but, not too straight from the body. The llamas pasterns should be strong and upright. 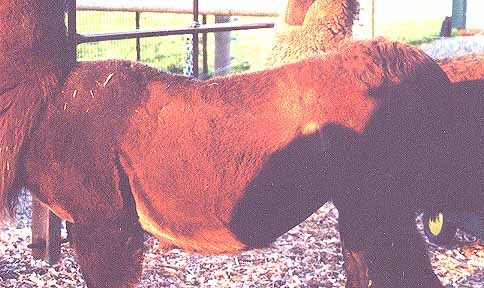 Llamas that are overweight might or may have dropped pasterns. Genetics can contribute to bad pasterns also. 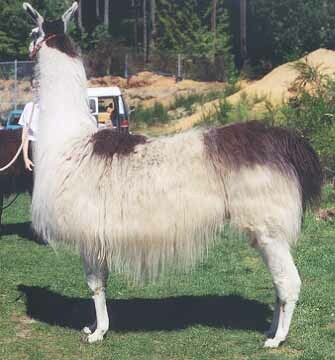 Obesity is a HUGE problem in llamas as it breaks the llama down and ruins their quality of life. Having poor nutrition and/or bad genetics contribute to this significantly. One of the many reasons you should buy from a reputable breeder with a good feeding program! 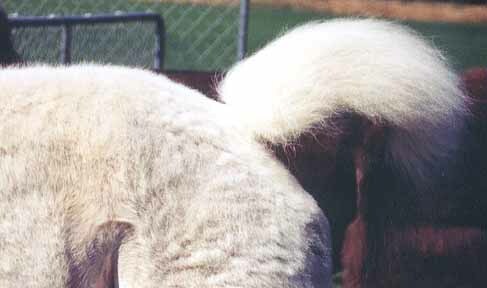 The topline should be flat. The tail should drop off the end of the back, but not be too far up on the back or too low on the back. 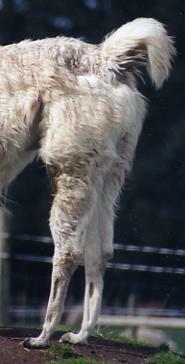 Age is a factor along with how many cria a female has had, in determining their topline quality. BUT a llama should still look healthy and upright well into their teens. Many breeders say "Oh but he/she is 10 etc...." This is not an excuse! 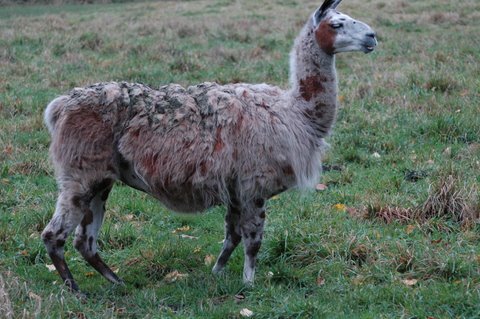 Llamas can still look healthy and good if they are bred well and taken care of! GOOD topline and neck to back balance. 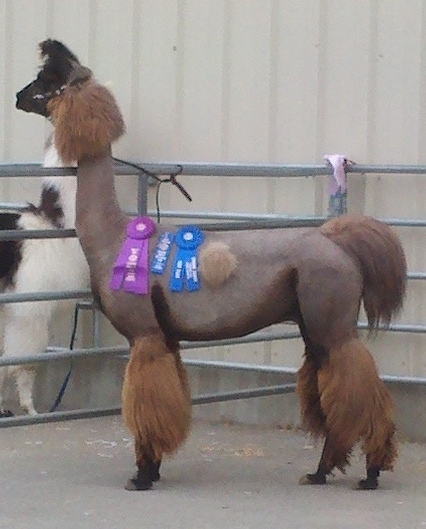 GOOD tailset an overall well balanced llama. 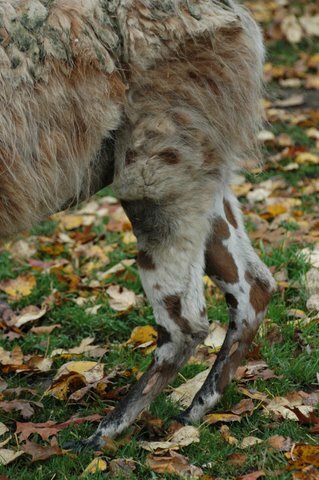 BAD Topline........This animal was only four when this picture was taken and had not had any cria. She was horribly obese and came from very poor breeding. 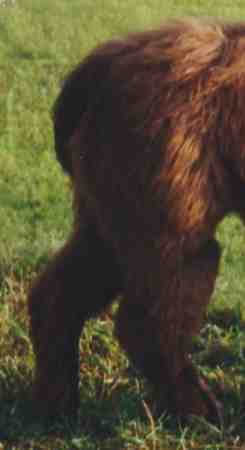 She is the sister of the brown animal below. BAD Topline and BAD Pasterns. This poor guy is totally out of balance. Notice the high rump and high spot at the base of the neck. He is long bodied and most likely is very overweight. The poor guy is dropping his pasterns in the front lower legs. His rear legs are also camped out slightly. first white female pictured above. Top- Notice how the joint right above the toes is all the way to the ground. There are different degrees of dropping, but this one is FLAT! Bottom left- Is a soft pastern not quite dropped yet. Bottom Right- Definitely dropped. These animal shown are crippled and should be carefully observed for pain and stiffness. In some cases they may need to be put down after a veterinarian has assessed the situation. Top left and right- This animal has front and rear dropped pasterns. Bottom left- More rear dropped pasterns. 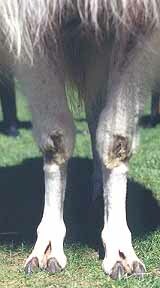 Bottom right- Down in the front pasterns with bulby type appearance to fetlock. "Polydactylia" (extra toes) VERY BAD. 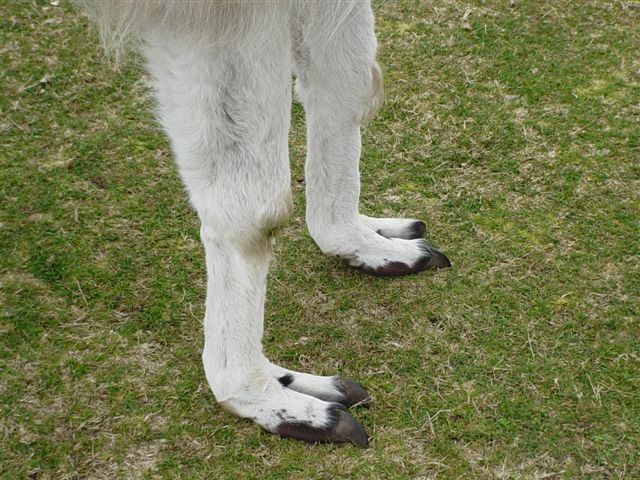 Llamas should have two toes on each foot. A genetic abnormality that occurs is called "Polydactylia" (pronounced POLY-DAK-TILE). 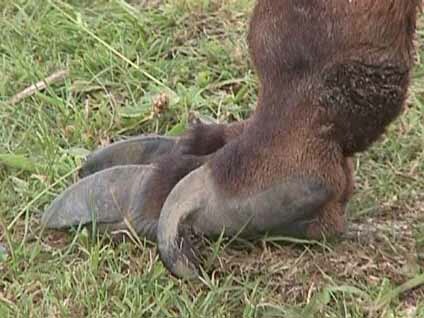 It is when the llama is born with more than the two normal toes on each foot. In these pictures (starting with top left) you will see the extra toe in between where there would only be the two toes. (see top right) In the second picture you will notice the middle toe and the upper dew claw further up the leg. (bottom left) This picture shows the extra toe on the side. (bottom right) Shows double toes on both feet. 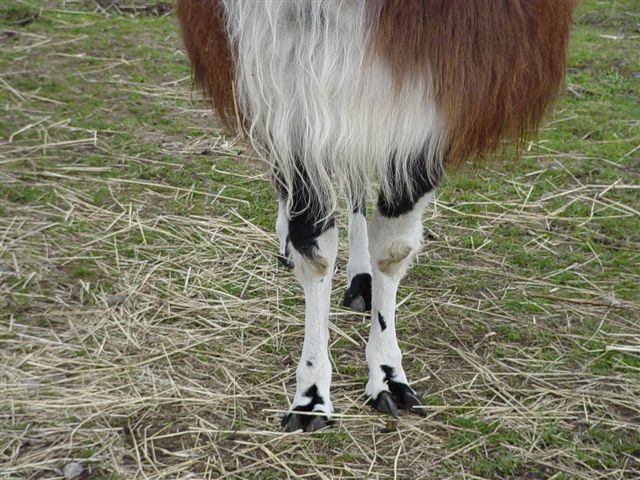 This animal's extra digits came from one of the worst genetic issue producers in the llama world. 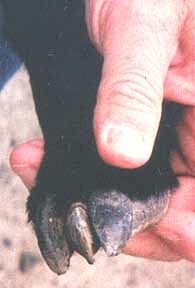 Polydactylia is an indicator of other genetic abnormalities such as "Choanal Atresia" (an upper respiratory problem) that results in the death of the cria (baby llama) in most cases. 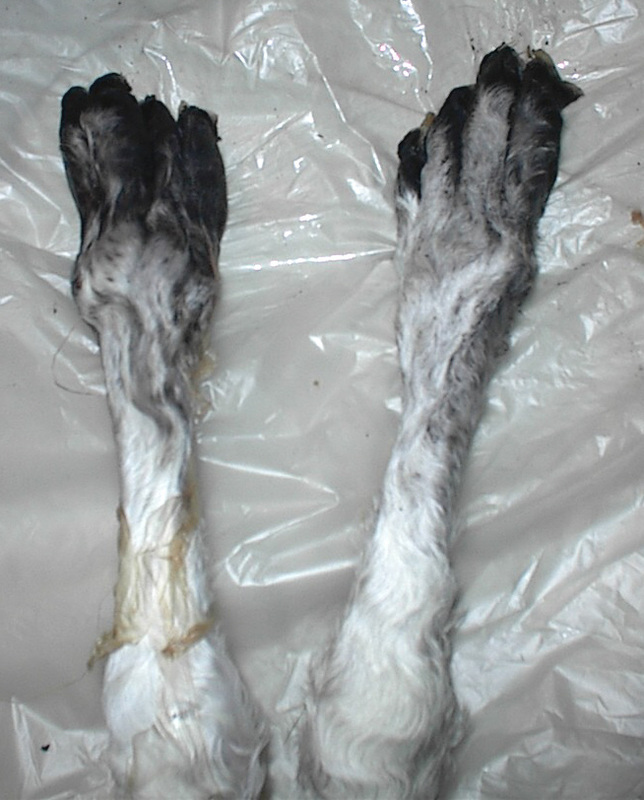 An animal with this condition should NEVER under ANY circumstances be used for breeding! Both parents should be pulled from a breeding program. It is genetic and not something to be taken lightly. "Post Leg" BAD. 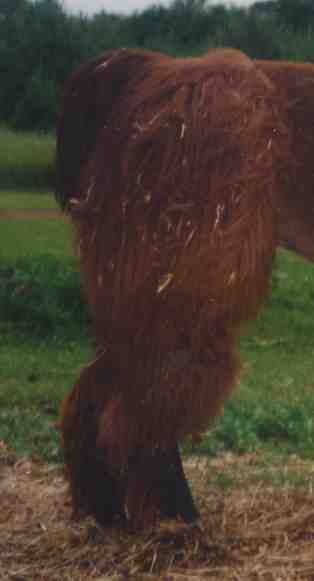 Notice how straight the rear legs are coming down from the body. There is NO angle to the hock as opposed to brown llama pictured first on this section. 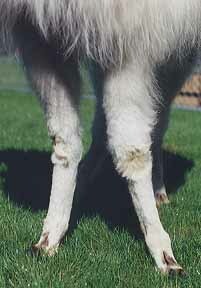 This is frequently seen in pack style llamas. "Sickle Hock" BAD. 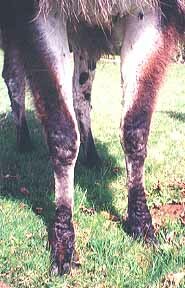 An over angulation of the rear hock. 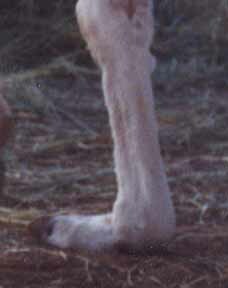 This is a very common trait in many of the longer wooled llamas and is not something that should be bred. From the side it resembles a sideways "V" in the rear leg. The bottom pictured animal has had this condition worsened by weight related issues. Notice too the that the front knees are starting to slightly buck (see Buck Knee below). Top BAD Front Legs. Top left- Too Close and angular at the knees. Notice the narrowness comes down from the body not just at the knee. Top middle- Starts wide at the top, comes in at the knees and goes out at the bottom. Top right- Angular at the knees and toed out at the bottom. 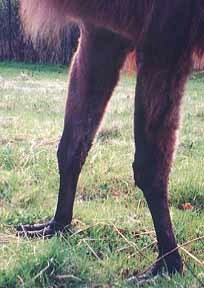 This animal is calf kneed also (see below) Both legs are angular from the knees. Bottom left- Not as pronounced angulation as the top right one, but still toed out and slightly angular at the knee. All of these animals would have big problems performing in a situation that required any sort of physical work. Bottom middle and right- GOOD front legs. More Bad Front Legs. Top left- The leg itself is straight but at the bottom toes out on both feet. This is a minor leg problem. Top right- The legs are narrow coming down from the body, but the legs themselves are straight and the toes are just slightly toed out. Middle left- This front shot shows a wide based llama. Notice how far out the legs drop down from the body and how it continues all the way to the ground. 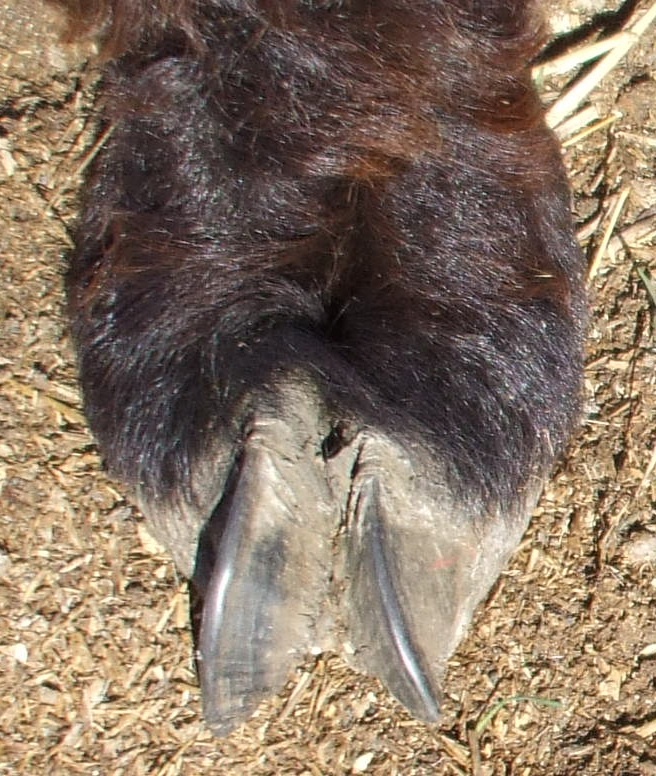 When this animal walks, the lower leg actually comes in with the upper part of the leg being much wider than the bottom in appearance. Middle right- The legs are narrow going down from the body to the toes. 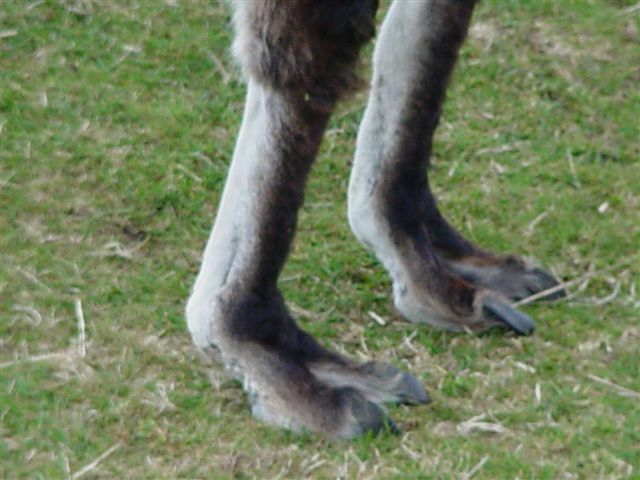 Bottom- Notice the left foot (and right), above the toes (the rounded area right above the toes) has a angle to it causing the toes to point to the right (and left). This is called "Splay Toed." "Buck Knee" More BAD Legs. 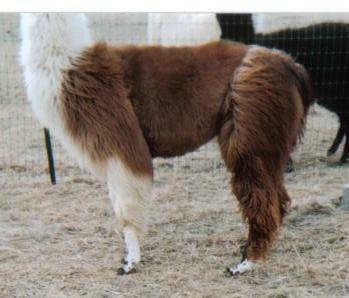 LEFT- This llama has the appearance of leaning forward on it's knees even when standing upright and straight. Notice the slight forward look of the knee. 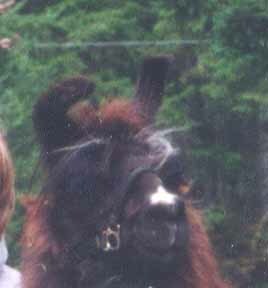 Also notice the FLAT pasterns, this llama was 26 when this picture was taken. 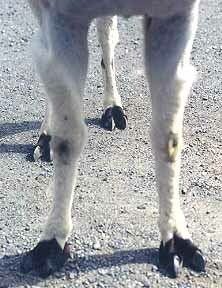 RIGHT- This llama is back at the knee (calf kneed). Notice the backward look to the knee area on the opposite side leg. BAD Rear Legs. Top left- While these legs do come down from the body with no angle, they are too close together making the llama look base narrow. 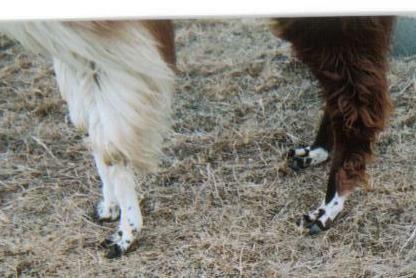 Top right- These rear legs are going out at an angle and the left leg is more angled than the right. Middle left- The legs are too close together and they angle out at the knees. Middle right- These legs are too far apart. They do come down straight from the body, but they are wide based. More BAD Rear Legs. Top left- This llama is bowlegged in the back...notice the legs bow and the toes are going in. Top right- This llama is cowhocked. The hocks are pointing into each other. 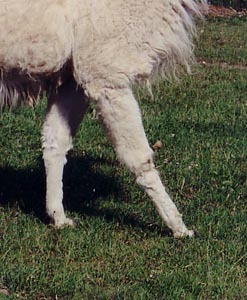 Bottom- This llama is way too base narrow in the back, the legs are too close together. right off the end of the back. Know that temperament, can be very genetic. High strung or aggressive animals can make more of the same! When breeding you should pay attention to not only conformation, BUT disposition and trainability. Certain lines will produce mellow easy to train babies and other lines produce negative behaviors that should not be perpetuated. Temperament should always been considered when pairing animals for breeding. Coat type should also play a factor in your breeding selections. For example, you should not breed medium or heavy wooled llamas for packing. Packers prefer classic type coat styles for packing and physical work. Research the type of animal that does the job you may want to do, prior to just breeding and trying to make a square peg fit into a round hole. 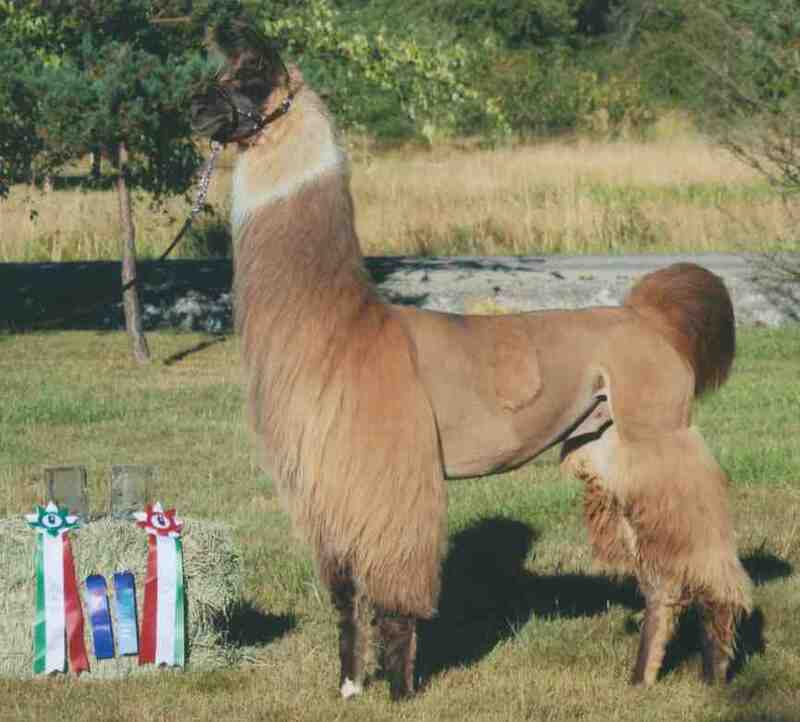 A llama who (for example) turns out with lighter wool from a suri breeding program is a failure in your goals. A good livestock breeder always tries to breed best to best. Knowing about conformation is important and should always be considered when breeding anything. 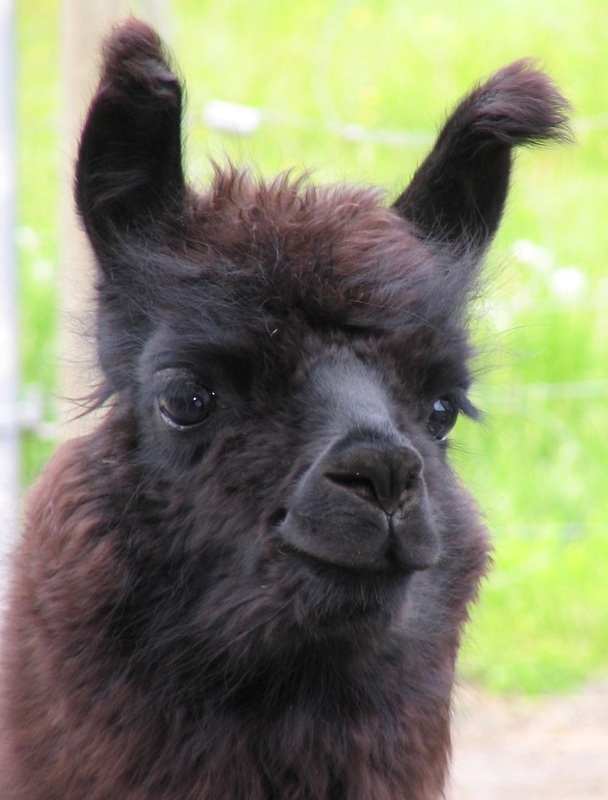 Llamas live 20-25 years and need to have good bodies and minds to live a healthy existence. Llamas with poor structure have a compromised quality of life. This webpage in no way is meant to indicate that you shouldn't also see an animal walk and touch it. It is important to view an animal from a standing and moving position. You should also touch them to make sure that the wool is not hiding anything! 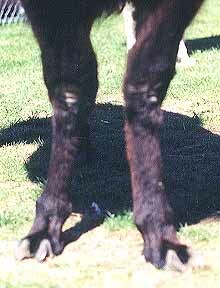 This webpage is meant only as a tool to help you see some of the obvious problems with llama conformation. If you have any pictures or defects you would like to add to this page, please contact us!